Jesus at the Post Office! 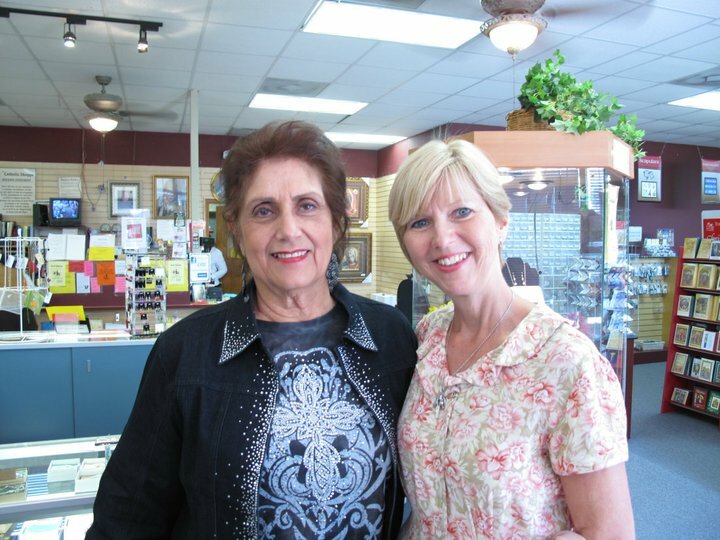 Here is a segment from a past Christmas radio segment in which I chat with Teresa Tomeo about meeting "Jesus" in the Post Office. Just click here to listen to it as well as some other Christmas reflections we talk about. The recipe for the Overnight Christmas Bread coming up! Have you seen this Digital Nativity? Author, television host, blogger, speaker, mother: Meet Donna-Marie Cooper O’Boyle, and find out what keeps her driven to accomplish so very much. 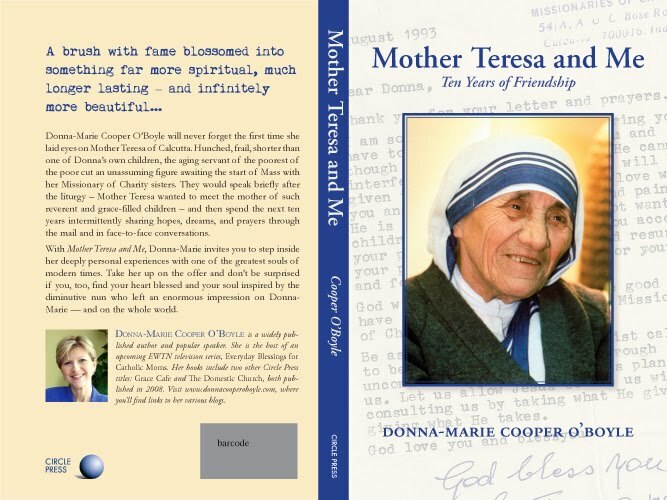 Donna-Marie, your friendship with Mother Teresa’s has undoubtedly affected your work; one need not look farther than the foreword for Prayerfully Expecting: A nine month novena for mothers-to-be or Mother Teresa and Me: Ten Years of Friendship for evidence. How exactly did your friendship with the Mother Teresa begin, and is it possible to pass along any wisdom she has given you that has held particular affect? By the grace of God, my friendship with Blessed Mother Teresa began. 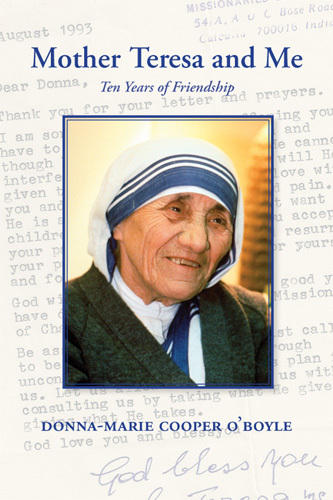 I recount all of the details in my book: Mother Teresa and Me: Ten Years of Friendship. I traveled with my family to Washington DC to visit Father John A. Hardon S. J., a renowned theologian and author who happened to also be my spiritual director. We had a wonderful meeting and he then encouraged us to visit the Missionary of Charity sisters and the sick and dying they cared for at the convent in DC. Well, Mother Teresa happened to be visiting the country at the time and was at the convent! The rest is history, as they say. Again, it’s all in my book, the whole story. Suffice it to say that Fr. Hardon was responsible for me meeting Mother Teresa. Is it possible to pass on any wisdom from her that has affected me? That would... You can see the interview here. This is beautiful and informative. Life on the Rock announcing a COOL contest! You'll want to see this. 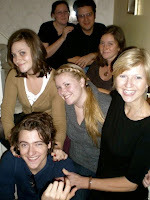 The guest is Suzane Haugh from the Goodness Reigns website. You may be familiar with this website as I've mentioned it before here. I contribute to a couple of blogs on the beautiful website. You can check out the website here. A refreshing look at the meaning of the Christmas tree (above). Advent is a wondrous season of preparation as we make ready our homes and beautify our churches; decorating for a beautiful upcoming Christmas celebration. It’s not all about the decorations, wrappings, and music, though. It’s easy to get caught up in the exteriors. Yet, we must also take the time to prepare our hearts to receive the Christ Child. We can purge ourselves of some of the clutter that constantly fills our minds and our hearts to make room to allow Jesus in. “O marvelous exchange! Man’s Creator has become man, born of the Virgin. We have been made sharers in the divinity of Christ who humbled himself to share in our humanity” (Antiphon I of Evening Prayer for January 1st). We read in the Catechism of the Catholic Church “When the Church celebrates the liturgy of Advent each year, she makes present this ancient expectancy of the Messiah, for by sharing in the long preparation for the Savior’s first coming, the faithful renew their ardent desire for his second coming. By celebrating the precursor’s birth and martyrdom, the Church unites herself to his desire: ‘He must increase, but I must decrease’” (# 524). As we renew our “ardent desire” and prepare for the celebration of our Savior’s birth, in this period of waiting and anticipation, let’s take some time out to pray, meditate, and recall that Our Savior, Jesus was born in a simple stable into a poor family. We know that His mother, Mary and stepfather Joseph led a challenging life and were initially shunned because of Mary’s pregnancy and then turned away from a suitable place in which to give birth; being forced to seek shelter in an animal’s home instead. For centuries, prophets, succeeding one another in Israel, had announced Jesus’ coming. Yet, our Savior’s birth took place very humbly and quietly; hardly what one would expect for a King’s birth—a holy occurrence of extreme magnitude. Humility, simplicity, holiness and silence surrounded the Holy Family in Bethlehem. Baby, Jesus rested His Sacred head on a bed of straw in a simple manger when He was not on his mother’s breast. Common shepherds were the first witnesses to the breathtaking awe-inspiring event of the birth of the Messiah. Heaven’s glory, so deserving of a posh setting and splendor with trumpets sounding, was made manifest in sheer poverty. Amazing! And as we await our Lord’s birth in this season of quiet and anticipation, most of us are surrounded not with the blessing of simplicity and silence, but instead, with glitz and glitter, noise, bold advertising, and even shoving and fighting for parking spaces at malls in a race for sale items, the latest iPod, or cell phone. Our holy season has been reduced to a preoccupation about whether or not we can manage to get our hands on a Wii Nintendo system or some other “needed” electronic item before it’s sold out, rather than striving to come closer to Our Lord in prayer—such a severe contrast to the reality of Jesus’ birth—of the true meaning of His coming to us in the form of an innocent Child. We do know that to enter the kingdom of Heaven we must become like a child. Jesus did this literally for us. We need to humble ourselves to become little. We absolutely need to make time for prayer. Visits to the Blessed Sacrament will bring us very close to Jesus and give us amazing peace, grace, and strength for our journey. When we cannot get out, prayer within our domestic churches is just fine and pleasing to God. Retreating deep into our hearts, seeking our Lord throughout our busy days of Advent will keep us in communication with Him and help us focus on what is essential during a season of hustle and bustle. While we take time out during what is meant to be a season of quiet, to pause and contemplate, what will we learn about the mystery of our Lord’s simplicity and humility wrapped in swaddling clothes and laying in a manger? What can we do to recapture and rekindle this holy time of year amid the chaotic atmosphere of our time? Let’s begin in our families, slowing down to pause and pray, seeking moments throughout our days to offer our hearts fully to God. Taking the time to give of our time which is really a priceless gift and not something we will find at a shopping mall. Parents should make the time for prayer within their families no matter how busy they feel they are. Teaching children to take even a moment out each morning to greet our Lord, thanking Him for a new day, offering it all to Him, and asking Him to use them, will help transform an ordinary day into opportunities for grace and redemption. Parents should make use of the dinner table as a time of coming together, lighting the Advent wreath, praying together and enjoying each other’s company away from the busy world outside the doors of the home. We can be a light to the world, to all around us, much like the star that drew the Magi to the Christ Child. Let’s think about what can we do or what changes we can make to become a light and lead the way for others. How can our words and actions, by God’s grace, help to convert hearts? Let us pray that we will draw others to Jesus because they see Him living in us. The light within us—Christ’s light—will draw others to the blessedness of our Christianity. “Only when Christ is formed in us will the mystery of Christmas be fulfilled in us. Christmas is the mystery of this marvelous exchange,” we learn from the Catechism of the Catholic Church (# 526.) Let us pray that Christmas will be truly fulfilled in us all as we strive to become “little,” allowing Christ to live through us, lighting the way to Heaven. All my "ducklings in a row"
I've been so busy with writing deadlines, working on my new book, and family activities. No time lately for a blog post, sorry about that. It's a special time of spiritual growth and reflection as we journey through Advent. I hope you're finding moments to pause and ponder and whisper prayers from your heart even as the advertising frenzy blasts all around you. There's so much we can thankful for, no matter the circumstance - God is near - always! He wants us to come closer to Him and trust our lives to Him. Then He can really work through us to touch other's hearts! I will be back soon, God willing to bring you inspiration. In the meantime, what have you been up to? What kinds of Advent traditions are you practicing in your "domestic church"? What tradition can you start brand new this year? Leave a comment and let me know. By the way, I am having a sale on my new book, A Catholic Woman's Book of Prayers. Go to my website and scroll down to the bottom left of the main page to find the discounted Pay Pal button. If you'd rather not use Pay Pal, email me at DMCOBoyle@aol.com and let me now what books you'd like and who to inscribe to. I'll email you back with the price and you can send me a check and I'll get your order right out to you. All books will be autographed and I send them out with a blessed medal. God bless and a big hug! Donna-Marie Cooper O'Boyle is in my top 10 of favorite authors; I am slowly acquiring everything she has ever written. I recently received A Catholic Woman's Book of Prayers and, again, was not disappointed. The book is slim and easy to fit in a bag to take along to soccer practice, the dentist, Eucharistic Adoration...wherever. I've been keeping it on my bedside table and reading snippets before bed each night. I really enjoyed how Mrs. Cooper O'Boyle weaves saintly quotes with reflections on different areas of feminine life. She also sprinkles in personal anecdotes here and there among the prayers shared. The chapters are not long, but they are quite deep. Each paragraph has a gem of wisdom that makes me want to open it back up and read it all over again when I think I'm finished. This is a book to keep with you, in a purse or diaper bag, to pull out at the beginning of the day, throughout the day, and at the end of the day. Inspired by the words of John Paul II in his encyclical, Mulieris Dignatatem, and his Letter to Women, A Catholic Woman's Book of Prayers seeks to convey that all women are entrusted with the human being. This little book allows for a deeper awareness of the "entrusting" that John Paul II spoke of. Drawing you back to the heart of Christ through encouragement, gentle prayer, and saints to walk with, this book is one to put on your wish list. You can also see the review here. Thank you dear "Exspectantes" for your beautiful review! This is great! I want to do this! See if you can watch this FULL SCREEN...ENJOY. You'll love it! Thanks to my friend, Fr. James for the video and the challenge to do it! Do you need a lift? Watch this to the end. If we didn’t have hope, what would we do? Without hope many would despair. We don’t have to look very far to realize that so many live without much hope. When I think of hope, I recall the virtues of Faith, Hope, and Love which we ask for on our first three Hail Mary beads of our rosaries. Hope becomes ours for the asking. Amazing! We have to remember to ask. St. Clement of Alexandria wrote, “If you do not hope, you will not find what is beyond your hopes.” Hope makes me also think about trust and surrender, which go hand and hand with our belief and love of God. When we have hope in our hearts we will be putting our trust in Our Lord and will be able to put one foot in front of the other each day, serving Our Lord in the people He surrounds us with. To do this, we surrender our lives to God through prayer so that we grow closer to Him and deeper in holiness. As we light our first Advent candle very soon, a flickering flame will represent hope. Let us pray that we can focus on preparing our hearts to open wider for Our Lord this Advent season. Let’s hope that we can do our best to turn to prayer at every opportunity during a great season of hope and promise. Perhaps the craziness of the advertising frenzy that flashes around us is too distracting, and we feel that we cannot find peace to pray during a season that is meant to be quiet so that we can prepare our hearts for the Christ Child. The Liturgy of Advent emphasizes quiet, penance, prayer, but also hope, light, joy, and surrender. Let’s strive to find those things. Let’s delve deeper than the surface and also realize that God is in control of everything. We can find quiet even amid the hustle and bustle, by lifting our hearts to God with a great hope and faith that He hears us – that He knows our hearts – that He loves us more than we can imagine! An awful lot can be accomplished if we allow God to work through us to sanctify our actions and prayers when we offer it all to Him in full surrender. Our Lord calls us to surrender our lives to Him – everything! Surrendering can be as simple as accepting our circumstances, whether it be our living conditions, our state in life, both little and big annoyances, sickness and suffering, being misunderstood, being criticized and belittled for our Christianity. God’s hand is mystically in it all. He knows what‘s going on. Will we surrender to Him and allow Him to work through us and around us? He wants us to surrender our wills to Him and respond in love to all who are in our midst. Yes, even to love the one who has just stolen “your” parking space or the one who is constantly criticizing you. It’s not always going to be easy. Jesus never said it would be. However, they all need our love; a healing love that will give others hope. Mother Teresa had said that “Calcutta is all over the world for those who have eyes to see.” Let’s open our eyes so we can minister to the needs of the people that because of God’s divine providence are near us in some way – our family, co-workers, friends and parishioners. Is there someone who needs our love? When we learn to surrender our lives over to Our Lord, we will have lasting and true peace, and joy of heart. This joy and peace will radiate as a healing balm to others around us; offering them hope for their journeys. Let’s be that ray of hope by giving our hearts to God and allowing Him to work through us during this upcoming wonderful hopeful season of Advent and beyond! A review of my book Mother Teresa and Me: Ten Years of Friendship (from Amazon.Com). This reviewer recommends this book as perfect for Lent. I'd like to suggest it as a book of reflection for Advent too. "This book was a fabulous read during this Lenten season. This book is an easy read, yet so deep. It is a personal, up-close relationship with a Saint, Blessed Mother Teresa. Donna-Marie Cooper O'Boyle has a gift from God that allowed her to share Christ by sharing Mother Teresa with us-the reader. I found the longing of my heart's search for Christ's passion for our souls in reading about Donna-Marie's relationship with Mother Teresa. Donna-Marie shares intimate moments of her life with us to show us how God works in all things. She shares intimate moments of her friendship with Mother Teresa so that we can be a part of this friendship by doing everything "with Jesus, for Jesus, and toward Jesus." It is not for the "holiest" of us, it is for all who thirst. Mother Teresa's view of serving Jesus in others one person at a time has helped me realize that I don't have to be called to a third world country to help the poorest of the poor. I need to start with the people in my own home, and go from there, loving one soul at a time. Pages 153-156 are some of my favorites. I read this book while sitting in a whirlpool for my foot during physical therapy. Agreeing with Donna-Marie, 'there is no such thing as a coincidence.' I shared this book with my physical therapist. It was beautiful! God is amazing!" You can see this review and others here. Thank you very much for your review. May God bless you in great abundance and may Mother Teresa guide you! I'll try to write some updates for you soon. In the mean time, here's a radio segment from a previous Thanksgiving about "Keeping it sane, simple, and holy" with Teresa Tomeo and me on "Mom's Corner." A Catholic Woman's Book of Prayers is a delightful retreat with beautiful prayers and quotations to ponder. I especially appreciate the bow to the vocation of single women who make such a contribution to the Church and the world at large. Recognition of the dignity of women is so crucial to lifting women up to their full, God-given potential. The prayers Donna-Marie includes in her book are brimming with joy in the knowledge that God loves each and every woman no matter what their state in life. Donna-Marie's love for God and for her fellow women shines forth in this lovely little book packed with hope and healing. What a great stocking stuffer too (hint, hint)! Thank you for your beautiful review, June! May God bless you! Folks, this book is available through my website at a 10% discount for a very limited time. Go to my website and scroll to the bottom of the main page and click the button on the bottom left to receive the discount. All books come with a blessed medal and will be autographed. You may also order through Our Sunday Visitor's website, Amazon.Com, Barnes & Noble.Com, or your local Catholic book store. I've started a prison ministry. I would love to get at least one of my books Mother Teresa and Me: Ten Years of Friendship into every prison library. You can learn more about it and why I started the ministry here. I will try to post some news very soon. My life is a whirlwind! Watch the trailer. This is GREAT! Please watch this and pray with all your heart, and do something to end this senseless killing! He was my mother's best fiend's spiritual director! have a look...lots of good stuff! A version of my story is here. Yesterday, I was at the counter of the Post Office mailing off a few packages of books. One large parcel was going to China! Yes, China. Someone there had ordered all of my books and a few of them in multiple copies. I have been praying for the recipients for the past couple of days since the order arrived. A line was building behind me, as often happens at the Post Office. As I left the counter the clerk gave me instructions about how I might track the package after I expressed that I sure hoped it would get there. As I headed out, a gentleman in the line called out and asked if I was sending out another manuscript. I recognized him from church and said, "No, actually someone in China ordered a bunch of my CATHOLIC books! I sure hope they won't be persecuted in any way." The gentleman said, "God is using you all over the world!" About twenty people or more waiting in line looked on. I'm sure they heard the word "Catholic." I said it loud enough. As it came from my lips out loud in the public place, I smiled inside. God is good! I am so happy that my books will be reaching people in China. Please pray along with me for the recipients and that the parcel gets to the right place without any problems. Thank you so much in advance. This is not a FISHY story! I want to share a story about one of my encounters while visiting in Texas. 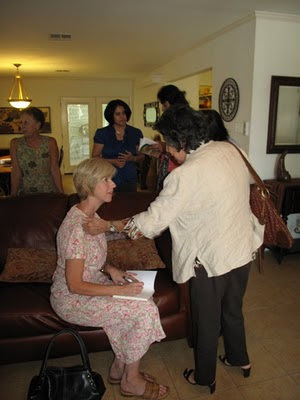 Many of you may know that I recently traveled to San Antonio and Corpus Christi to give a couple of talks and book signings. 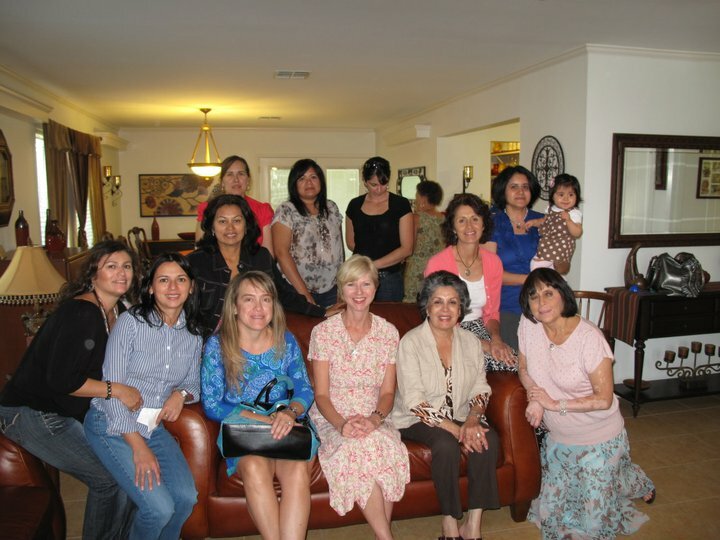 After I finished my work at a huge conference for women in San Antonio put on by the Pilgrim Center for Hope, a friend drove me to Corpus Christi where I would stay for a few days and meet with many of the women I spoke to at a retreat a little over a year ago. Excited that I'd be back to Corpus Christi, the women of St. Helena's went ahead and arranged some book signings, informal talks and various get-togethers. 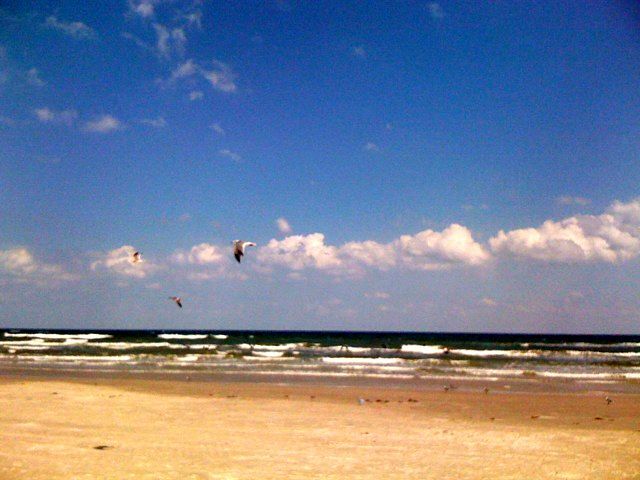 It had been a very busy working summer back home in Connecticut (no time for a break), and I was really looking forward to putting my feet in the ocean at the National Seashore where I had visited on my last trip to Corpus Christi. So, my friend and I made a quick "pit stop" to the beach. We took off our sandals and walked to the water and stood there taking in the gorgeous views of God's Creation, while experiencing the wonderful sensation of warm ocean water flowing across our feet. We would only be there for about ten minutes before Katherine would drive me a bit further up the road to my destination. But, standing there just about took my breath away. The ocean always brings a special peace to my heart. I was thankful for those moments and hoped to fit in a couple of hours more of that beauty and blessing in the coming days in between my upcoming events in Corpus Christi. 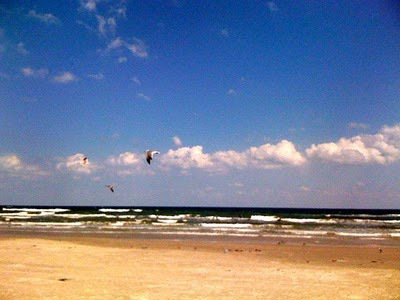 See the pelicans flying over the ocean? We saw that there was a fisherman wading in the water, busy with his poles. I said "hello" to him and we began a little conversation. The fisherman asked where we were from and we explained that Katherine was from San Antonio and I was from Connecticut. Then the question was asked, "What brings you to Corpus?" 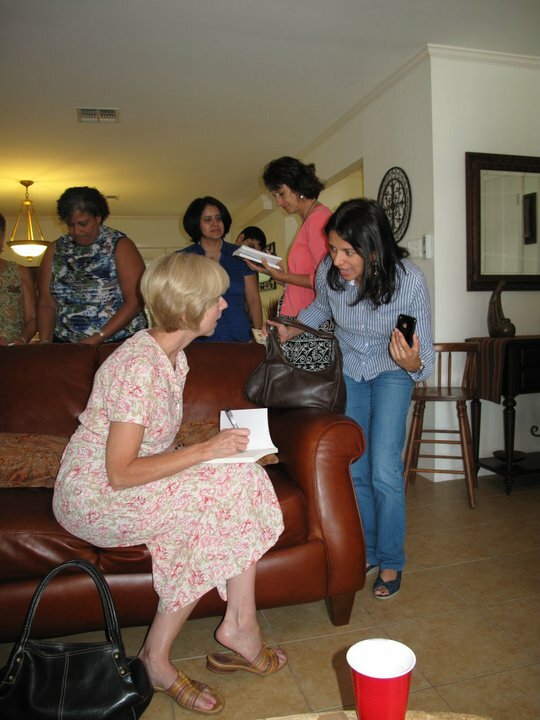 So, I explained that I was a Catholic author and had given a talk and book signing in San Antonio and would now visit some friends in Corpus and do a couple of more book signings before heading back home. We talked a little about my books and Mickey, the fisherman told me he knew his wife would be interested in reading my Mother Teresa book. I told him I'd get a business card from my purse and give it to him just in case he and his wife would like to look me up on the Internet to learn more about my books. I asked him about his fishing. He said he loved to be there in the ocean and "think about nothing." I knew what he meant, but I suggested it was also a very good time to "pray." 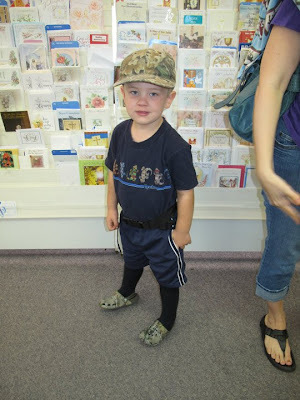 We then chatted about the fish he had caught and he expressed that he really wanted "to catch a big one - like about a 24 inch fish." An inspiration suddenly came to me and I said, "I'll tell you what, I am going to pray that you catch a BIG fish. If you do, I want you to do me a favor and thank God for the fish." He said, "You know, I'm not picky. It doesn't have to be today. It can be in the next few days." I was secretly thinking that, perhaps if he caught the big fish, he'd think about praying and thanking God. So, I reminded him about the idea a couple of more times and then I asked if I could take his picture. He agreed, and, better yet, he said, "Let me hold up my fish." So, I braved the millions of anchovies that were swimming all around my feet in the shallow water darting madly into my ankles, and went in a little further where they were even thicker to snap a shot. We said our "good byes." I thought about that fisherman on and off for a few days, praying that he caught a BIG fish, if it was God's will. 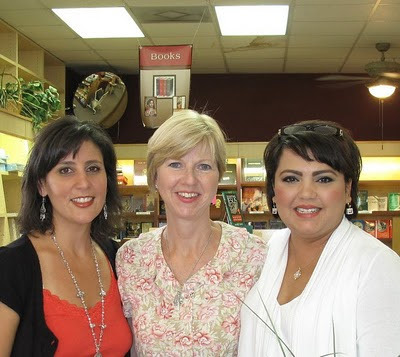 I had a very nice time in Corpus Christi visiting and giving talks and book signings. I went home to Connecticut on Thursday. After Mass this morning, I received an email from the fisherman! The subject line said, "Your prayer for big fish for me." My heart soared. "Wow, that fisherman wrote to me, what a blessing!" I thought, and then quickly clicked on the email to see the message. He wrote, "Last Sun. Met at beach in Corpus Christi. You took a pic of me with string of fish. U said U would pray for me to catch big fish. If u did, it worked. 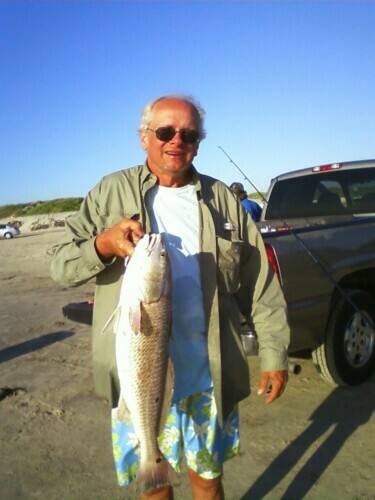 30 inch red drum on Wed. Thank you." Imagine that? God is so good! The fish was even bigger than he hoped for. I was so happy I had given him my business card so that I could find out about his BIG fish! We wrote back and forth in a few more emails. 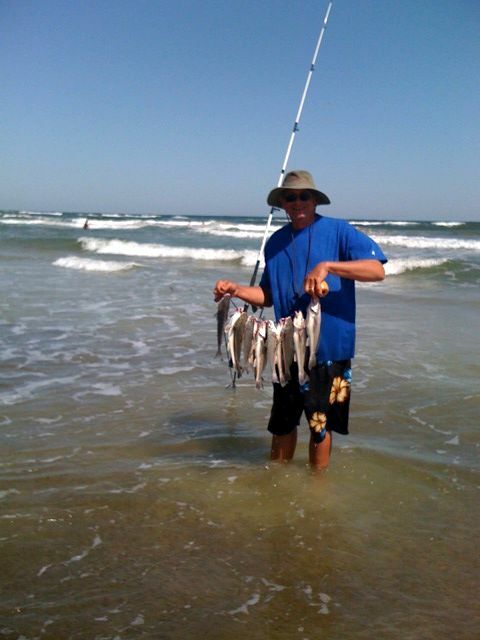 He told me that he left Corpus Christi on Thursday (the day after he caught the BIG fish and the same day I left) because he was scheduled to attend an event and then head home to another area of Texas. He said he was happy that we met. This fisherman will hold a special place in my heart. I sense that God touched Mickey in a special way out there in the ocean. Only God knows, but I pray that this fisherman will think of God and prayers every time he goes fishing, and maybe even more often than that! 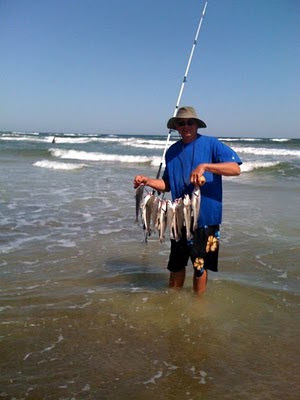 Here's my fisherman friend holding up his thirty inch fish! Prayers were answered! I know that our dear Lord wants us to spread His love everywhere - at the grocery store, the Post Office, on a plane, in the ocean - EVERYWHERE! Remember, He calls us to be FISHERS of men! Sweet times in Corpus Christi, Texas! I just recently gave a key note talk at a woman's conference in San Antonio, Texas at an event put on by the Pilgrim Center for Hope. I am awaiting photos of the event to post here on my blog. So, that will have to be in another post. 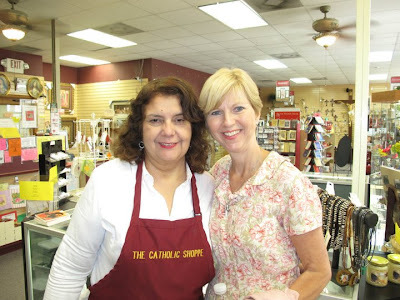 After that amazing event in San Antonio where I spoke to 500 or so women and met with them afterwards at my book signing table, I went on to Corpus Christi, Texas to visit the women I gave a retreat to a little over a year ago and to see my dear friend, Fr. James Farfaglia whom I actually grew up with in Ridgefield, CT (but we didn't know it at the time!). I actually graduated one year before Fr. James. More on that in the Foreword I am writing for his new book which I'll tell you about soon. While in Corpus Christi, Texas to visit at St. Helena's I also did a book signing at a local Catholic store called the Catholic Shoppe. 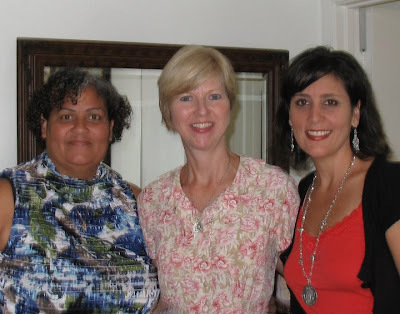 The same day (in between the two book signings at the shop) I attended an impromptu luncheon put on by a sweet friend, Nury at her home. I say "impromptu" because Nury came up with the idea the afternoon before and put on such a beautiful luncheon you would have thought it was planned for weeks! Taco salad, fruit, fresh home made soup (just for me! ), Sangria (yum! ), and home-made flan, made by Nury. I'm sure there was more, too, but these are the highlights. I met with my friend Rosie's friends and gave a talk to them about Mother Teresa after our lunch and also signed books for the women. 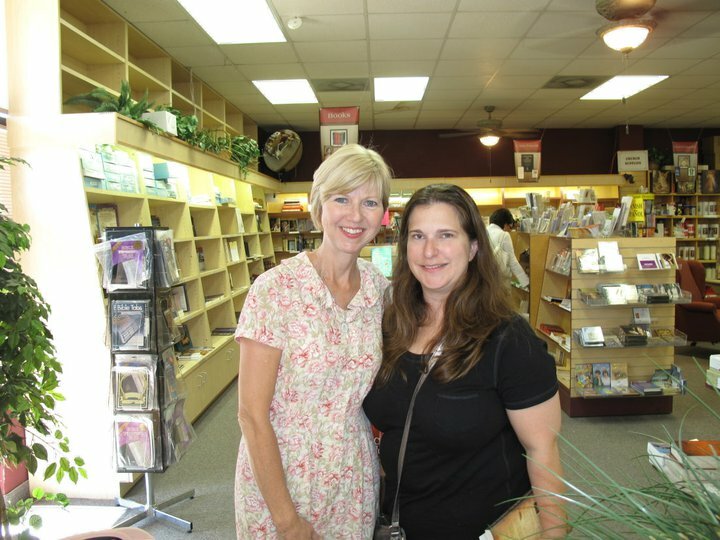 After that it was back to the Catholic Shoppe for another book signing. Then, later on that night, I enjoyed an informal dinner at St. Helena's with some of the women from the parish. Stay tuned for more news and photos of the remainder of the day in a while. I just returned from my visits to San Antonio and Corpus Christi, Texas (news and photos coming up!). Until I get a chance to post some photos and news, you can take a look at a post from Fr. James's blog about my visit to Corpus Christi and St. Helena's: by clicking here. I met Fr. Samuel this morning in Corpus Christi, Texas! I am in San Antonio, Texas - arrived last night after traveling through thunderstorms and torrential rains, and two BUMPY flights. God is good and all is well. I will be leaving my hotel room shortly to go over and do a book signing at a very special retreat put on by the Pilgrim Center of Hope here in San Antonio. 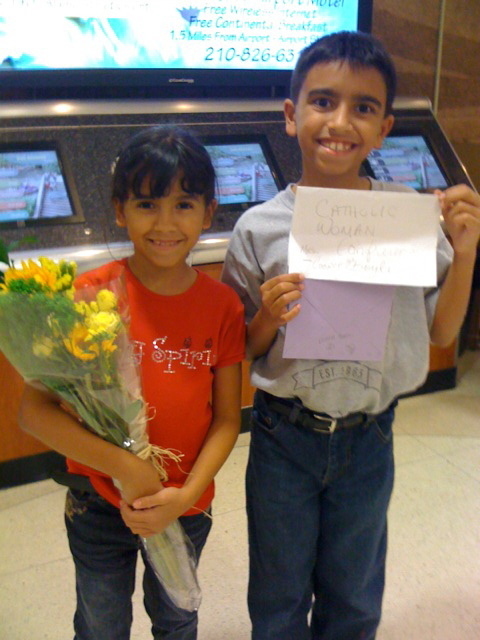 I was greeted by a sweet family last night and here are the two children I met in the airport who were there along with their mother. They warmed my heart! Please pray for everyone who will be there. I have a lot of catching up to do with all of you! I've been quite busy but plan to continue my Rome story as soon as I can. Here's a sweet picture of the faith-filled boys and girls at Mass this morning whom I was blessed to be with due to the kindness of one of the Moms whom I met last night. I prayed for all of you at Mass and during the Rosary this morning. I better get ready. My ride will be here shortly! Pray for all of us please. God bless you! 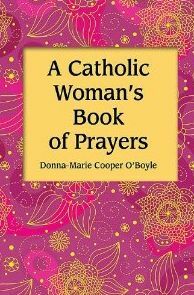 Our Home on the Range: The Catholic Company Book Review: A Catholic Woman...: "A Catholic Woman's Book of Prayers by Donna-Marie Cooper O'Boyle This is a little hardcover book (just a bit bigger than 4' x 6') that is j..."
Very excited about the release of my new book! A Catholic Woman's Book of Prayers! 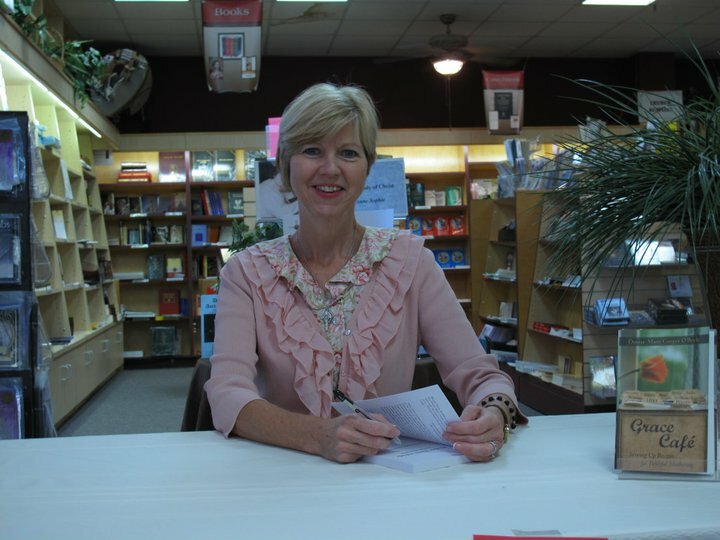 I am excited to be getting around at various book signings and events with my new book published by Our Sunday Visitor Publishing Company. This prayer book speaks to ALL women - single, married, mothers, and consecrated Religious! 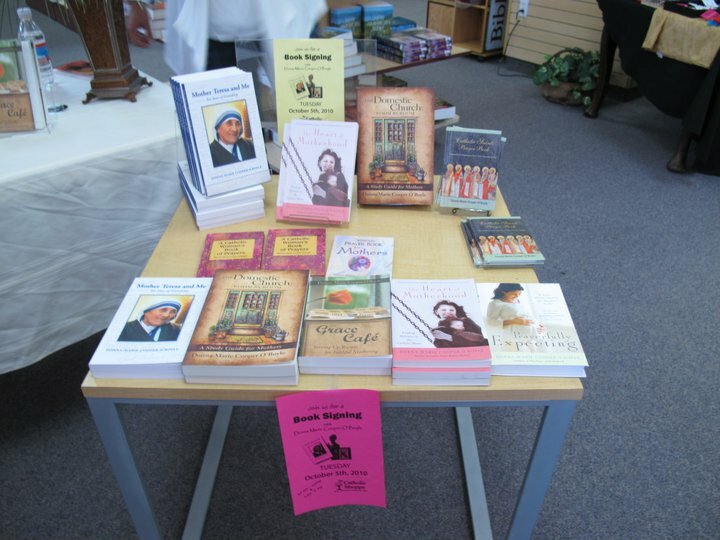 It covers the joys and difficulties of being a Catholic woman in our world today. It encourages the reader to strive for a closer relationship with God and it filled with prayers, verses and is sprinkled with inspiration and profound words from our Church and the saints. Here is a short yet very inspirational video on Rome Reports.Com about Chiara Luce Badano to be Beatified just 19 years after Her death. My friend Joan Lewis has much to teach us. Check it out! 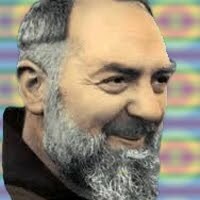 Padre Pio was born in Pietrelcina, Italy, on May 25, 1887. Ordained a Capuchin priest on August 10, 1910, Padre Pio stayed home for six years due to ill health. In September 1916, he was sent to the friary of San Giovanni Rotondo, where he remained until his death. Padre Pio was the first priest known to receive the stigmata, the visible wounds of the Cross. He bore these wounds for fifty years as he carried out his priestly ministry, inflamed with the love of Jesus. His Masses usually lasted one and a half to two hours, and in his teaching, he stressed the nature of the Mass as a holy sacrifice. Padre Pio was known as a great confessor, hearing confessions for ten to twelve hours a day. Millions came from all over the world seeking his counsel and consolation. He also possessed the gift of reading people’s hearts. Pio’s life can be summed up in three words: simplicity, humility, and obedience. Unjust accusations led Rome to order Padre Pio to stop saying Mass in public and hearing confessions while he was investigated (1931-1933). Although it caused him suffering, he abided by the restrictions without bitterness, until the matter was resolved. Word about Padre Pio’s saintliness spread around the world. More than eight million people came to see him in his last years. On September 23, 1968, Pio voiced his last words, “Jesus, Mary,” before breathing his last breath at the age of eighty-one. In the years following his death, miracles occurred around the world through his intercession as his reputation for sanctity continued to grow. Dear St. Padre Pio, you were an extraordinary servant of God, following in the footsteps of St. Francis of Assisi. In heaven you continue to serve God by interceding for us. Your heart went out to the poor. Help me to have eyes to see those in need around me and ears to hear the cries of the poor. Pray for me, please, that I may receive the graces I need to participate deeply in the Holy Sacrifice of the Mass. Please help me to desire humility, simplicity, and the spirit of obedience in my walk of life. Help me to realize the power in suffering united with the will of God. St. Padre Pio, pray for us and for all who invoke your aid. If it is in God’s holy will, please grant me (here mention your request). Amen. See more here at the GR blog. "God has created me to do Him some definite service. He has committed some work to me which He has not committed to another. I have my mission. I may never know it in this life, but I shall be told it in the next. I am a link in a chain, a bond of connection between persons. He has not created me for naught. I shall do good; I shall do His wo rk. I shall be an angel of peace, a preacher of truth in my own place, while not intending it if I do but keep His commandments. Therefore, I will trust Him, whatever I am, I can never be thrown away. If I am in sickness, my sickness may serve Him, in perplexity, my perplexity may serve Him. If I am in sorrow, my sorrow may serve Him. He does nothing in vain. He knows what He is about. He may take away my friends. He may throw me among strangers. He may make me feel desolate, make my spirits sink, hide my future from me. Still, He knows what He is about." Special thanks to Maria for sharing this prayer today! St. Thérèse's feast day is coming up on October 1st. Traditionally, novenas can be said 9 days prior to the feast day of a saint to obtain graces according to God's will. I know that some people start their novena to end just before the feast day and some end up on the feast day (9th day). So, you may begin the novena this Wednesday (tomorrow) or Thursday, whichever you are accustomed to doing. of the Child Jesus duringthe 24 years of her life. While at the "Church Up Close" conference I attended last week in Rome, I met Paul Burnell from BBC Online who also attended and became fast friends because he is such a joyful and faith-filled man. We were blessed to enjoy precious conversations over meals and gelato. I also had the pleasure of meeting up with my friend and colleague, Mary De Turris Poust whom I have known for a few years because of our Catholic writing work, but had not the chance to meet face-to-face until we both traveled to Rome from the east coast of the U.S. to attend the Catholic journalist's conference. Needless to say, I was constantly thanking God for the blessed opportunities to meet up with such wonderful people and get more up close (no pun intended!) with our Church too! a lot of walking (blisters to prove it) in search of a certain restaurant. And, what I'd like to share with you now, before I have a chance to continue with my blogging (Part Four) about my journey to Rome, is this wonderful piece at the OSV Daily Take below. Fellow conference-mate Mary De Turris Poust asked Paul to share his insights since he is there right now covering the Pope's visit to the UK. You'll love his vivid account weaving the past with the present. "I met Paul Burnell, a UK-based Catholic journalist, at "The Church Up Close" program in Rome earlier this month. Paul checked out of the newsroom to attend the beatification Mass for Cardinal John Henry Newman as a regular member of the faithful this weekend. I asked him if he would be willing to share his experience with OSV Daily Take. Thank you, Paul, for giving us this exclusive insider's view:"
"Pope Benedict came to Britain to beatify John Henry Cardinal Newman – one shy intellectual Catholic genius honouring another. But in a certain sense the pope’s visit resembled that of the forgotten hero in the Newman story – Blessed Dominic Barberi, the Italian Passionist who received Newman into the Church. Pronouncing the Church’s latest Blessed at the massive outdoor Mass in Birmingham on September 19, the Pope revealed that his feast day would be October 9, the day when Blessed Dominic arrived soaked to the skin and freezing at Littlemore near Oxford after traveling on top of a stage coach to Oxford from the North of England. Blessed Dominic believed in the conversion of England, a vision that had inspired his order’s founder, St Paul of the Cross. Little did he know how profound – yet unsung -- his role would be in English Catholicism’s Second Spring. Like Dominic I arrived freezing and soaked to the skin for the outdoor Mass in a park close to Newman’s grave and the hills where he sought R and R. We were delivered by our coaches – the police decreed no pilgrim could travel on their own – to a post industrial wasteland, the site of one of the UK’s biggest ever car plant..." Continued here. Catholic Moms of North East, Ohio Adoring Our Lord! I began blogging about my recent journey to Rome for the Church Up Close conference for Catholic journalists. Part one is here and part two is here in case you haven't had a chance to read them. I left off where I was taking a little rest in the homeless shelter, graciously allowed by the MC sisters in Rome. I got up from a very short rest, straightened up the bedspread on the bed and made my way over to the chapel to prepare for Mass. The chapel was beautifully decorated for Mother's feast day. How comforting it felt to be there in that holy and loving place. Time stood still for me at Mass. God was blessing me, I had no doubt. I spoke to Him about all of His blessings for me and asked for a place to stay that night until I could get the keys the following day to where I was supposed to be staying. The Mother Superior told me that a family she knew (who didn't speak English) would take me right after this Mass over to the other convent across town where the 7:00 PM Mass would be held. I had previously got word to my friend Mary while still in the U. S. (who was going to the Church Up Close conference as well) about the 7:00 PM Mass and hoped that she may be able to attend too. "Donna-Marie! Mother Teresa brought you here to us this day - her feast day! She wanted you to be in our shelter and feel these feelings!" It was as if she read my mind and heard my heart! I felt that her words to me were such an amazing confirmation about my earlier conversation with our Lord! God is so good. 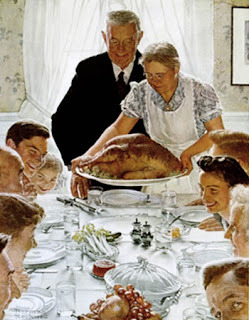 I was extremely thankful for His loving care and was so happy and humbled that He allowed me to experience all of this on dear Mother's feast day. I talked a bit with sister there outside the chapel and then went to get my luggage and give more of my books to the Mother Superior. 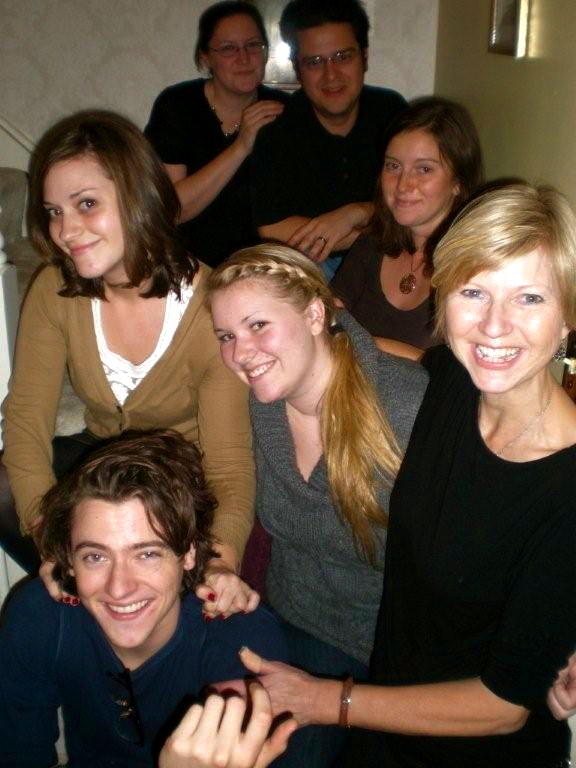 Then, it was off with the generous family who drove me across town to the other convent. It was there in the monastery next door that I was told I'd stay for the night. Upon arriving to the big church next to the convent, I had to get my HUGE suitcase up the many stairs that led to the church. The kind gentleman who drove me assisted me. I felt that I needed to constantly apologize for my heavy suitcase. When you're an author, you bring your books to give away, and books are heavy! They didn't understand a word I said which made it all the more embarrassing. I went over to the convent to see if I could let Sister S. know I had arrived. But, I was told that she wasn't there yet. She was over at Mother Teresa's exhibit. As I headed over for Mass, I turned a corner and there was the Cardinal coming towards me, reaching out his hand. I took it and kissed his ring. God was blessing me again! I made my way into the huge crowd to find a seat for Mass. Droves of MC sisters filled the church along with the laity. Many of the sisters humbly sat in the back over to the side and on the floor. I squeezed through some people with my lap top computer case hanging on one shoulder and my purse on the other and managed to get a seat a couple of rows from the back of the packed church. "Wow, two Masses on Mother's feast day - God is good!" I thought. 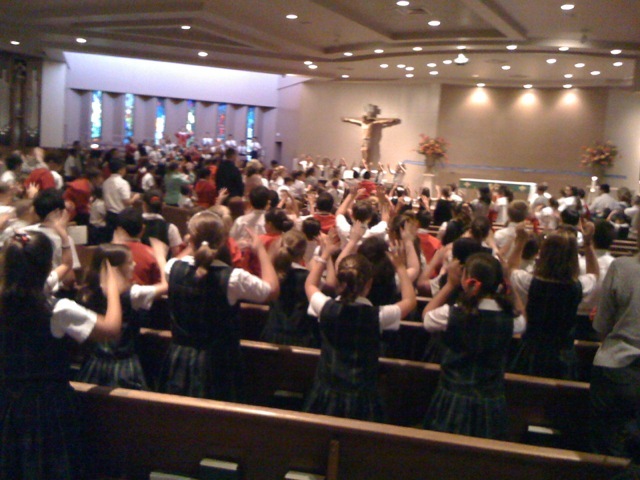 The music started and Mass was beginning. I bowed my head in prayer and then just moments later felt someone tapping on my shoulder from behind. I turned to face a MC nun. "Donna, it's me, Sister S., please come with me." She took me by the hand and led me through the crowd standing in the back of the church because she wanted to speak with me outside. "Donna, where will you be staying tonight? We can't put you up here. It's a men's shelter," she explained. My heart sank and I felt that little tear well up in my eye again (exhaustion can do that to you). "Oh, that's okay, Sister, I thought I was staying here but my friend Mary may be at this Mass and I'll see if I can arrange something or find a hotel." Sister said she'd be praying that Mary would be there. And I knew that it was getting later by the moment (and this would be a long holy Mass) and I wasn't sure where I would end up - would any hotels have vacancies? I went back to my seat, set down my things and prayed. "Oh, Lord, what am I to do? But, thank you for bringing me to this holy place, I know You have a plan. I surrender everything over to You." I felt our Lord tell me "I had no place to lay my head." I thanked Him profusely for allowing me to feel these feelings and to have the grace and really no other choice than to depend on Him. Prints of Grace: A Catholic Woman's Book of Prayers: " If I only knew Catholic wife, author, and mother of five Donna-Marie Cooper O'Boyle from reading her books, I would have been looking f..."
Last night I began to recount my journey in a blog post regarding my recent trip to Rome where I attended the "Church Up Close" conference for Catholic journalists. I "happened" to arrive in Rome, Italy on Mother Teresa's feast day. Those of you who know me I'm sure realize that Mother's feast day is a big deal to me. Here's the first post in case you didn't read it. So, there I was at the Missionaries of Charity convent, feeling quite exhausted as well as a bit awkward because of the way I showed up at the convent unannounced and with baggage, inquiring about a place to stay. I wasn't supposed to be there until later that evening to accompany the sisters to the feast day Mass at the other convent's church. Earlier, the Mother Superior told me that the plans had changed and the sisters would not be going to the 7:00 PM Mass. She explained that there would be a 5:00 PM Mass for Mother Teresa's feast day right there at the convent's chapel and I was welcome to come. "Great!" I thought. "I'll not only be able to get to Mass for my Sunday obligation, but I'll also be with the MC sisters on this beautiful feast day. God is so good to me!" Sister showed me where we'd store my suitcase for the time being and then ushered me to the the women's shelter and showed me a bed that wasn't being used. "You can rest on this bed," she told me. Then, off to the dining room where I was given a plate of food. As I ate my meal, a young woman from the shelter came quietly into the room and sat right across from me at the table. She seemed very interested in watching me eat. I asked her if she'd like some of my food and she said, "Si." So, I cut her pieces of my nectarine and handed her one at a time. She ate them right up and thanked me by nodding and smiling. I couldn't help but see Jesus in the young woman as she took each piece of fruit and asked me for more with her eyes. I was so thankful for God's grace on Mother's feast day - He was allowing me to experience this encounter of what Mother would describe as encountering "Jesus in the distressing disguise of the poorest of the poor." I then felt inspired to take out a Miraculous medal from my purse and asked the woman if she'd like it. "Si," she replied. I helped her to put it onto her plastic heart necklace that adorned her neck. She seemed so happy to be wearing it. I asked her if I could snap her photo. She was delighted. After a while, she left the room to sit out in the courtyard with the other women who lived in the shelter. I didn't plan to nap or rest even though I was really very tired and sore. I knew I'd probably feel worse from the jet-lag after a nap and Mass would be coming up soon as well. I wanted to make a visit to the chapel and have a little time to be with Jesus to express my thanks for all of His blessings. So, after I cleaned up my dishes, I made my way over to the Blessed Sacrament. On the way, I passed the huge bronze statue of Mother Teresa that I had seen last year while in Rome, only this time she was adorned with a necklace of flowers for her feast day. Later, Sister came and found me in the chapel and suggested that I rest. I did what I was told and laid down on the bed for about fifteen minutes or so, because it was already almost time for Mass to begin. I felt tremendous grace again, being given a unique experience to once again be in a women's shelter, lying on one of the beds. I had once stayed in Harlem, NY at the MC's women's shelter when I was there for a long week end to help with the soup kitchen and participate in the prayer life of the sisters while also being guided by a retreat at the convent given by my spiritual director, Fr. John A. Hardon S. J. I recounted that Harlem shelter experience in my book: Mother Teresa and Me: Ten Years of Friendship. That Sunday in Rome, I was feeling a great gift from God, allowing me to be at the shelter and MC convent, all the while still feeling a bit "homeless." This part of my experience is very difficult for me to articulate. The combination of being allowed to feel "homeless" and cared for at the same time is a grace that filled me with joy and gratitude. Thank you for your gracious invitation to make an official visit to the United Kingdom and for your warm words of greeting on behalf of the British people. In thanking Your Majesty, allow me to extend my own greetings to all the people of the United Kingdom and to hold out a hand of friendship to each one. It is a great pleasure for me to start my journey by saluting the members of the Royal Family, thanking in particular His Royal Highness the Duke of Edinburgh for his kind welcome to me at Edinburgh Airport. I express my gratitude to Your Majesty’s present and previous Governments and to all those who worked with them to make this occasion possible, including Lord Patten and former Secretary of State Murphy. I would also like to acknowledge with deep appreciation the work of the All-Party Parliamentary Group on the Holy See, which has contributed greatly to strengthening the friendly relations existing between the Holy See and the United Kingdom. As I begin my visit to the United Kingdom in Scotland’s historic capital city, I greet in a special way First Minister Salmond and the representatives of the Scottish Parliament. Just like the Welsh and Northern Ireland Assemblies, may the Scottish Parliament grow to be an expression of the fine traditions and distinct culture of the Scots and strive to serve their best interests in a spirit of solidarity and concern for the common good. The name of Holyroodhouse, Your Majesty’s official residence in Scotland, recalls the "Holy Cross" and points to the deep Christian roots that are still present in every layer of British life. The monarchs of England and Scotland have been Christians from very early times and include outstanding saints like Edward the Confessor and Margaret of Scotland. As you know, many of them consciously exercised their sovereign duty in the light of the Gospel, and in this way shaped the nation for good at the deepest level. As a result, the Christian message has been an integral part of the language, thought and culture of the peoples of these islands for more than a thousand years. Your forefathers’ respect for truth and justice, for mercy and charity come to you from a faith that remains a mighty force for good in your kingdom, to the great benefit of Christians and non-Christians alike. We find many examples of this force for good throughout Britain’s long history. Even in comparatively recent times, due to figures like William Wilberforce and David Livingstone, Britain intervened directly to stop the international slave trade. Inspired by faith, women like Florence Nightingale served the poor and the sick and set new standards in healthcare that were subsequently copied everywhere. John Henry Newman, whose beatification I will celebrate shortly, was one of many British Christians of his age whose goodness, eloquence and action were a credit to their countrymen and women. These, and many people like them, were inspired by a deep faith born and nurtured in these islands. Even in our own lifetime, we can recall how Britain and her leaders stood against a Nazi tyranny that wished to eradicate God from society and denied our common humanity to many, especially the Jews, who were thought unfit to live. I also recall the regime’s attitude to Christian pastors and religious who spoke the truth in love, opposed the Nazis and paid for that opposition with their lives. As we reflect on the sobering lessons of the atheist extremism of the twentieth century, let us never forget how the exclusion of God, religion and virtue from public life leads ultimately to a truncated vision of man and of society and thus to a "reductive vision of the person and his destiny" (Caritas in Veritate, 29). Sixty-five years ago, Britain played an essential role in forging the post-war international consensus which favoured the establishment of the United Nations and ushered in a hitherto unknown period of peace and prosperity in Europe. In more recent years, the international community has followed closely events in Northern Ireland which have led to the signing of the Good Friday Agreement and the devolution of powers to the Northern Ireland Assembly. Your Majesty’s Government and the Government of Ireland, together with the political, religious and civil leaders of Northern Ireland, have helped give birth to a peaceful resolution of the conflict there. I encourage everyone involved to continue to walk courageously together on the path marked out for them towards a just and lasting peace. Looking abroad, the United Kingdom remains a key figure politically and economically on the international stage. Your Government and people are the shapers of ideas that still have an impact far beyond the British Isles. This places upon them a particular duty to act wisely for the common good. Similarly, because their opinions reach such a wide audience, the British media have a graver responsibility than most and a greater opportunity to promote the peace of nations, the integral development of peoples and the spread of authentic human rights. May all Britons continue to live by the values of honesty, respect and fair-mindedness that have won them the esteem and admiration of many. Today, the United Kingdom strives to be a modern and multicultural society. In this challenging enterprise, may it always maintain its respect for those traditional values and cultural expressions that more aggressive forms of secularism no longer value or even tolerate. Let it not obscure the Christian foundation that underpins its freedoms; and may that patrimony, which has always served the nation well, constantly inform the example your Government and people set before the two billion members of the Commonwealth and the great family of English-speaking nations throughout the world. May God bless Your Majesty and all the people of your realm. Thank you.